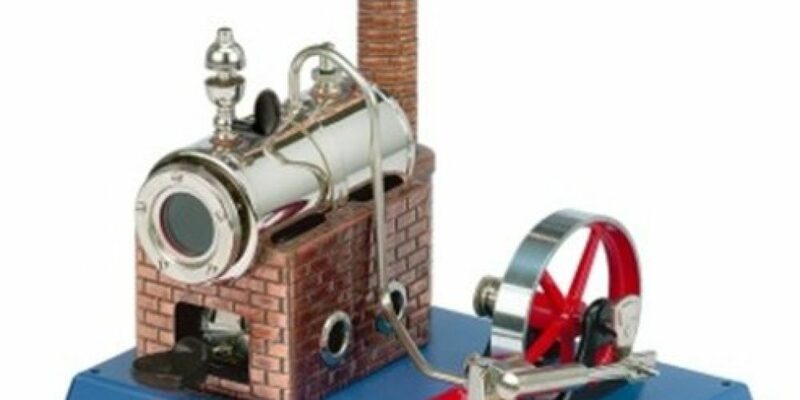 This is a gorgeous, highly detailed steam locomotive engine that is also a working model that produces actual steam. 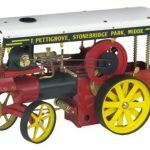 It’s ideal for beginner steam enthusiasts, especially younger ones as it can be used by children as young as eight years old. There is always something very special about steam engines, and the way they powered the industrial age. Models like this are a good introduction to this time period, and a hand-on way to learn about history and engineering. If you are giving this to a child, bear in mind that it will require adult supervision and is most certainly not suitable for children under three years old. It is also a working steam engine and it does turn the flywheel quite fast. The D5 Steam Engine from Wilesco is in kit form, so you’ll have to assemble it, but that’s more than half the fun of having a working model. Assembly is straightforward; there’s an easy to follow manual, which includes illustrations so you don’t feel lost trying to work out what goes where. No soldering is needed; the components are put together by screwing them into place. It’s an attractive model, with a faux red brick platform and chimney stack, rather like a Victorian factory might have had. The boiler has a shiny, brass effect thanks to the nickel finish, as does the oscillating cylinder and the piston. 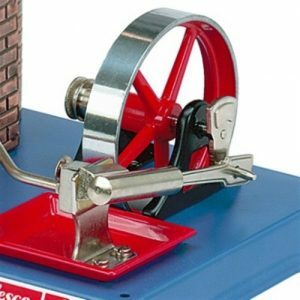 There is also the red and brass effect fly wheel. 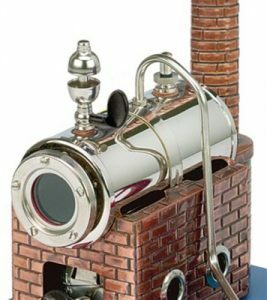 There’s an inspection glass that is the water level indicator at the front of the boiler, with a dome steam powered whistle on top. The spring safety valve is also located here, and this is where you need to insert the water using the funnel. The piston and wheel generate power, and once in motion it gets quite a speed up. This is a noisy toy, and you do get a lot of steam, all of which makes it quite exciting to watch in action. The engine used a dry fuel to heat the water for steam. There is no need for additional batteries. 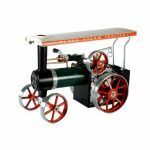 It really does bring to life the age of steam, and it has identical specifications to Wilesco’s D6 steam engine. The D5 is the kit version, and the D6 comes fully assembled. 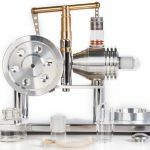 The Wilesco D5 Steam Engine Model Kit is quite light, weighing just 739g. This is not a huge model, even though it is fully powered. But it is a good enough size for an entry level type of kit at 21 x 15 x 15 cm. It should be possible to use the engine to power small devices by connecting to a dynamo too. There are lots of possibilities, and you are only limited by your imagination. There are other Wilesco models that you can attach to the engine, and you can drive other Wilesco models from its range.